'Prickly pear' is a general term used to describe the Opuntia species, members of the Cactaceae family. 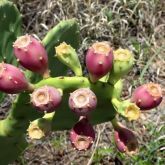 Native to the Americas, prickly pear is a spiny, drought-resistant succulent that rapidly invades pastures and natural areas and overwhelms other vegetation. Perennial, leafless, succulent shrub, usually 50–100cm tall. Stems are spiny, flattened, leafless, divided into segments (pads or joints). Skin is thick, tough, drought-resistant. Fruit is pear-shaped, bristly, varies from red to purple, orange, yellow and green. Flowers are large, 6cm wide, range from yellow, orange, red, pink and purple to white form seen during spring. Seeds are 5mm long, have hard seed coats that allow them to survive heat and lack of water. Most internal tissues are used for water storage. Outer parts are used to reduce water loss and damage by animals. Some species develop underground bulbs that enable them to resist fire and mechanical damage. See the Opuntioid cacti fact sheet (PDF, 12.4MB) for more information on Opuntia species descriptions. Prefers subhumid to semi-arid areas in warm temperate and subtropical regions. Varies depending on species and can range from streams, banks, and roadsides to woodlands. See the Opuntioid cacti fact sheet (PDF, 12.4MB) for more information on Optunia species distribution. Asexual reproduction (cloning) occurs when pads (joints, segments) or fruits on ground take root and produce shoots. Pads can survive long periods of drought before weather conditions allow them to set roots. Flowers late spring to summer. Vigorous in hot, dry conditions, causing other plants to lose vigour or die. Impedes stock movement and mustering. Can harm animals and prevent them from eating. Spread by birds and animals eating fruit and excreting viable seed. Also spread by animals and floods moving broken pads long distances. Using machinery is unsatisfactory because prickly pear pads can easily re-establish. Fire is an effective control method for dense prickly pear infestations. Before burning, consult Biosecurity Queensland to see if this practice is suitable for your pasture and land management practices. See the Opuntioid cacti fact sheet (PDF, 12.4MB) for herbicide control and application rates. Investigations into biological control agents began in 1912. Over 150 insect species were studied throughout the world, with 18 insects and 1 mite released in Queensland. Tetranychus opuntiae, prickly pear red spider mite. These biological control agents continue to keep several prickly pears under control. Not all of them attack all prickly pears. Most successful of these species were the Cactoblastis stem-boring moth and the four cochineal mealybugs. The other agents remain but not in sufficient numbers to provide control. 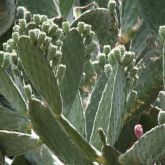 All species of Opuntia are prohibited invasive plants except for O. microdasys, O. elata, O. stricta, O. aurantiaca, O. monacantha, O. tomentosa and O. streptacantha species which are restricted invasive plants. Opunita ficus-indica (Indian fig) is not a prohibited or restricted invasive plant. This is a prohibited invasive plant under the Biosecurity Act 2014. The Act requires that all sightings to be reported to Biosecurity Queensland within 24 hours. By law, everyone has a general biosecurity obligation (GBO) to take all reasonable and practical steps to minimise the risk of it spreading until they receive advice from an authorised officer. This is a restricted invasive plant under the Biosecurity Act 2014. Opuntia microdasys and O. elata must be reported to Biosecurity Queensland within 24 hours of being sighted.